Sometimes we’re lucky enough to observe great moments in nature. In this instant, self and subject are one. Awareness that the air beneath your wings is the same air that trills in my throat. I see you, I am here! With much meaning and gratitude this portrait was brought to life. 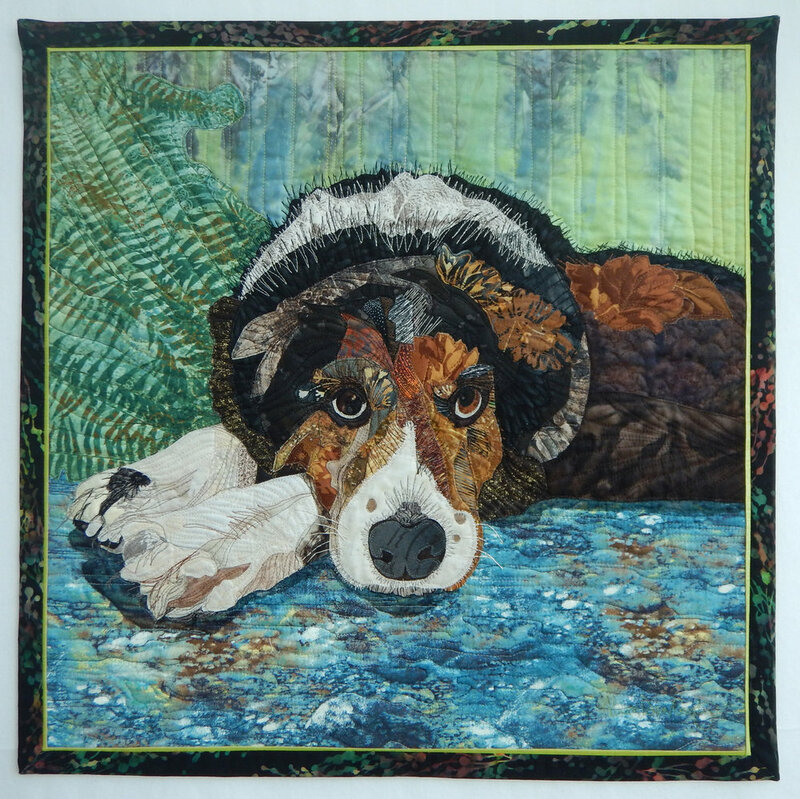 A physician and friend was intrigued with my previous work using fabric as an art medium and she asked me to make a portrait of her Border Collie, Leo. He is a beloved family pet who is in his twilight years. It was my goal to communicate his loyal and gentle spirit in fabric. For me it comes alive when I get the eyes right! My inspiration is the character of a west coast family’s Chocolate Labrador Retriever. He’s the (old) man of the house who commands importance within the family and his environs. He draws you in to his world and dares you to throw the ball one more time! I was commissioned to make a piece for a graduation gift. The client wanted a compilation of all the daughter’s bird friends, which included all her beanie baby stuffed animals from when she was growing up plus her real bird, Chico. It was too complicated to make as a complete fabric piece, so I used a combination of acrylic paint and fabric. Chico and the border are made from fabric. I added the words that he said, “Pretty bird" and "I love you”. Technique: acrylic painting fabric collage. This quilt is my first commissioned work. Friends were inspired by my first fire piece, Mountain Blaze – Playing with Fire. I said that I would remake it larger for their liking. I finished it in time to enter it in the Calgary Stampede Arts and Crafts Showcase in 2015 and it won 3rd place prize money. 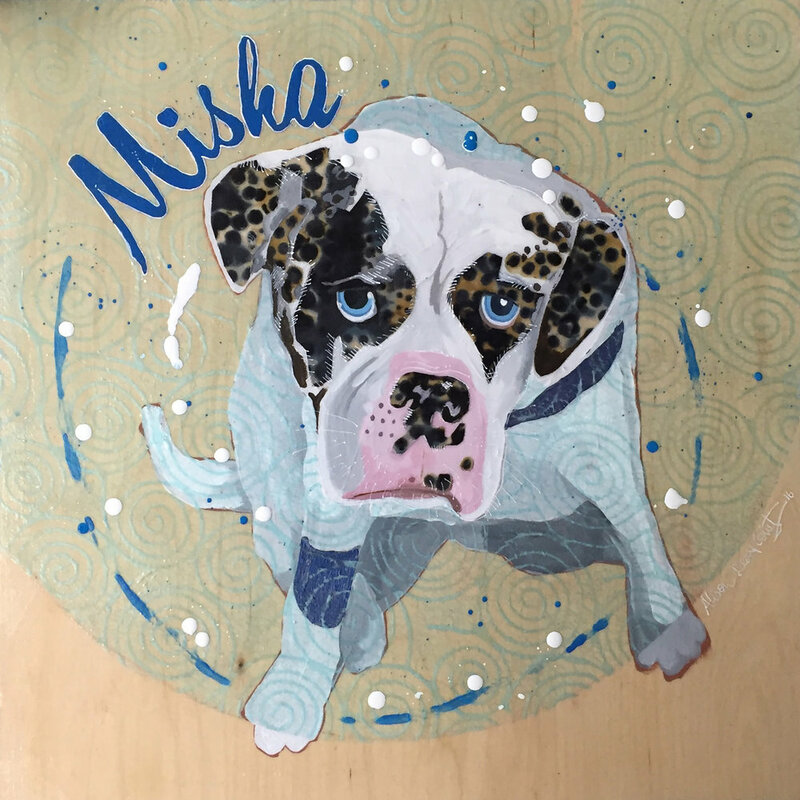 My inspiration is a friend’s Alapaha Blue Blood Bulldog. She has such an interesting face and colour markings that I wanted to interpret in acrylic paint, fabric and paper. Technique: Acrylic paint and fabric collage. Inspired by bold floral printed fabrics and underwater experiences I set out to interpret my scuba diving experience underwater. Mixing hand dyed fabrics and commercial motif patterns designed and collaged an ideal underwater garden.